Publisher / Place of Publication: An Cumann le Béaloideas Éireann/The Folklore of Ireland Society / Newman Building, UCD , Belfield Dublin 4. About: The author collected these stories in the area of Hacketstown, Co Carlow and the adjoining West Wicklow hinterland in 1934. The settings for these fairy and ghost tales range from Glenmalure to Aughavanagh, Tinahely and Knockananna. Echoes of folk tales told across national cultures will be found in the pieces collected here. Contents: The Fiery Dragon – The Mermaid and the King’s Son — The Haunted House — The Haunted House (another version) — The Soldier and the Gun — The Hare, Lion, Eagle and Spider — The Enchanted King and Queen — Wednesday, Thursday, Friday — Castle of the Underworld — Cinderella — The Farmer and His Three Sons — Jack the Giant Killer — The Jealous Husband — Jack Bound to a Robber — The Crock of Gold — The Man and the Corn — Story Without End — In Search of Stories — Magic Milking — The Magic Hare — The Old Woman and the Priest — Bewitching of Butter I – III — The Fairy Rath — Escape from Robbers — Tales of the Fairies I – XXIV — Editorial Note. 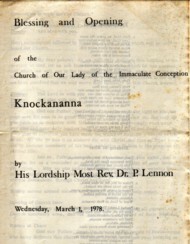 Publisher / Place of Publication: [Knockananna History Book Committee] / Knockananna, Co. Wicklow. About: A book all about Knockananna and a premium example of a local history produced with local community involvement. Credit to local authority and other publicly-funded bodies without whose support this high-quality publication would have not have been produced. Chapters: Foreword — Roots — Churches – Famous people — Religious — Winters of entrapment — Business — Place names — Military — Associations — Services — Memories — Tributes — Education — Sports — Tragedies — Hyde Corner — Making the headlines — Scholars of Rathmeigue / Knockananna — Acknowledgements. Extra #1: Contains illustrations, photographs and newspaper cuttings. Creator / Author: Ken Hannigan and William Nolan (editors) & contributors. Publisher / Place of Publication: Geography Publications / 24 Kennington Rd., Templeogue, Dublin 6W. 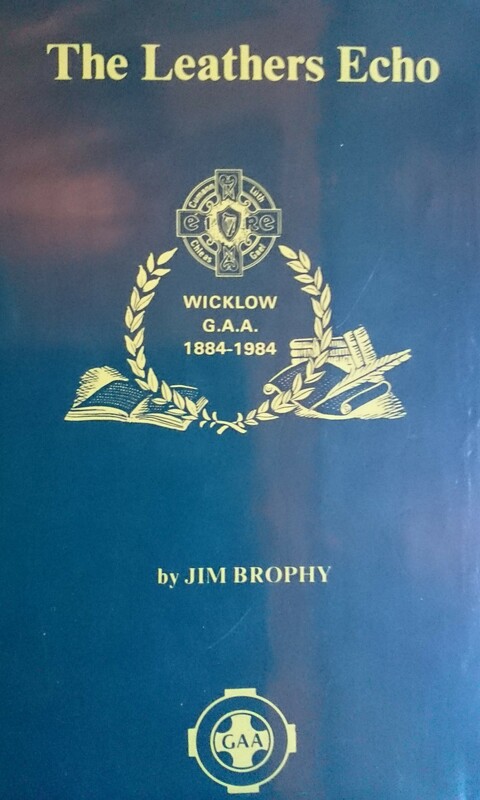 About: The major history of the County of Wicklow, this is the seventh volume in the Irish County History Series which eventually aims to cover all 32 counties. It brings together 25 essays written by experts in their field and covers aspects of Wicklow history and society from prehistorical to modern times. Contents: Wicklow’s prehistoric landscape / Geraldine Stout — Kings, saints and sagas / Alfred P. Smyth — Evidence of Scandinavian settlement in Wicklow / Colmán Etchingham — The unity of Cóemgen and Ciarán: a covenant between Glendalough and Clonmacnois in the tenth to eleventh centuries / A. S. MacShamhráin — Medieval Wicklow -‘A land of war’ / J. F. Lydon — Anglo-Norman settlement in Uí Briúin Chualann, 1169-1350 / Linzi Simpson — Three settlements of Gaelic Wicklow: Rathgall, Ballinacor and Glendalough / Harry Long — Settlers’ utilisation of the natural resources / Rolf Loeber — The Byrnes of Ballymanus / Conor O’Brien — The rebellion of 1798 in County Wicklow / Ruan O’Donnell — Masters of the mountains: the insurgent careers of Joeseph Holt and Michael Dwyer, County Wicklow, 1798-1803 / Thomas Bartlett — Politics and rebellion: Wicklow in the 1790s / L. M. Cullen — The Poor Law in County Wicklow / Eva O’ Cathaoir — Vernacular rural dwellings of the Wicklow Mountains / F. H. A. Aalen — The holy wells of County Wicklow: traditions and legends / Geraldine Lynch — Land and landscape in County Wicklow / William Nolan — Synge and Wicklow / Nicholas Grene — A survey: some Wicklow maps 1500-1888 / Patrick Power — The mining community at Avoca 1780-1880 / Des Cowman — Wicklow before and after the famine / Ken Hannigan — The evolution of forestry in County Wicklow from prehistory to the present / Mary Kelly Quinn — From Grand Jury to County Council: an overview of local administration in Wicklow, 1605-1898 / Brian Donnelly — Parnell and his neighbours / R. F. Foster — A rightful place in the sun: the struggle of the farm and rural labourers in County Wicklow / Ross M. Connolly — ‘The water was the sheriff’: the land beneath the Poulaphuca reservoir / Fiachra Mac Gabhann — A select bibliography of printed books on County Wicklow / Joan Kavanagh. 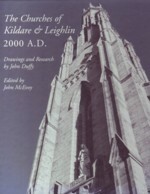 WW Connection #1: Contains several essays relevant to West Wicklow history and archaeology. Extra #2: Contains a fold-out reproduction of Jacob Nevill’s 1760 map of the county.